This king size dub album is a lion of a record roaring with dub plates, rarities and obscure gems. Dominated by the drums of Sly Dunbar it represents a golden period when Channel One held the key to much of what was to follow in reggae music. 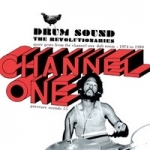 The sound of Channel One, which achieved worldwide prominence in the mid-seventies reggae boom, wielded an unparalleled influence throughout the world. Its origins were based on Ernest and Jo Jo Hookim’s lifelong love of music and their fascination with the way it was made. They were true visionaries and it is impossible to overstate the influence that the brothers’ custom built studio wielded on the development of Jamaican music. The Channel One drum sound was totally unique and Sly Dunbar, along with engineers Ernest Hookim and Barnabas, would spend days perfecting it. As its fame grew all kinds of people, including Sting and The Clash, came to the studio to try and capture some of the magic that was created down on Maxfield Avenue. The magical sound became familiar through hundreds of reggae recordings and many of the best tunes were released on the Hookim’s Well Charge and Disco Mix labels and on the Channel One label itself. This is where the material on ‘Drum Sound’ is sourced from: seventeen killer tracks that showcase the very best of Channel One. This is probably the strongest dub album yet to be issued on Pressure Sounds packed full of music that no Sound System was and is complete with out including a King Tubby’s cut to Junior Byles’ timeless ‘Fade Away’ and the iconic ‘Kunta Kinte’. Never before released ‘Kunta Kinte’ could only be heard on a dub plate, notably on Jah Shaka’s legendary Sound System, which still plays Kunta Kinte dubs to this day. Beautifully mastered and carefully restored with all of Pressure Sounds’ customary attention to detail the album is available on double vinyl and compact disc in the usual eye catching packaging replete with a wealth of images and information. There will also be an extra special limited edition seven inch release to coincide with the album starring two further dub cuts of Kunta Kinte’ not available on the album… or anywhere else.